Hi from Copenhagen!!! I have been here since Saturday afternoon (or Saturday morning American time), so a little more than two days! Arriving in Copenhagen, settling in with my host family, and starting orientation has met me with some serious homesickness that I proudly did not expect. Seeing friends from Vanderbilt, navigating public transportation by myself, and coming home to my host family at the end of the day has made this foreign place feel a little more familiar. We landed in Copenhagen at about 2pm Saturday, and after getting our baggage, we were directed to our individual housing. 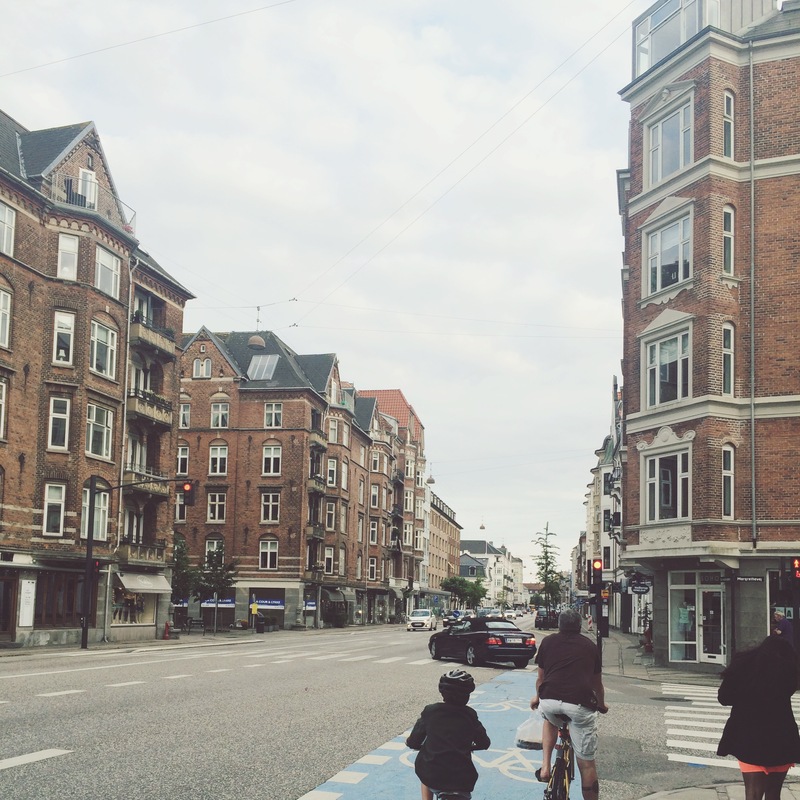 I am living in a homestay with a sweet family of four in Hellerup, a northern suburb of Copenhagen. My family is wonderful- the parents so welcoming and their 14-year-old twin daughter and son are so excited to teach me about Denmark and hear about America. I’ve never had siblings, let alone be the “older” sibling, so this will be an adventure! The last couple days have been full of culture shock moments, so I figured I would share a few of the things I have observed! Before dinner on Sunday, I ventured into “downtown” Hellerup because I had forgotten a hairbrush in all my packing! Oops. Hellerup is similar to what we would call a suburb in America, but closer to and more integrated with city life, at least than I’m used to! I learned that Danes bike everywhere. Bike lanes are on pretty much every major street that I’ve seen so far, which is different than America. I’ve only been to a couple cities in America that have bike lanes, but here they are huge and even have their own stop lights and turning arrows and everything! Sometimes, the sidewalk is on the outside of the bike lane, closer to the road. I didn’t know that one part of the pavement was the bike lane instead of the sidewalk, so I got yelled at by a biker behind me when I was in his way! I stopped in a supermarket, and found that Danes use their flag for decoration so much! I really like the design of it, and maybe that’s just because I’ve already seen it everywhere! 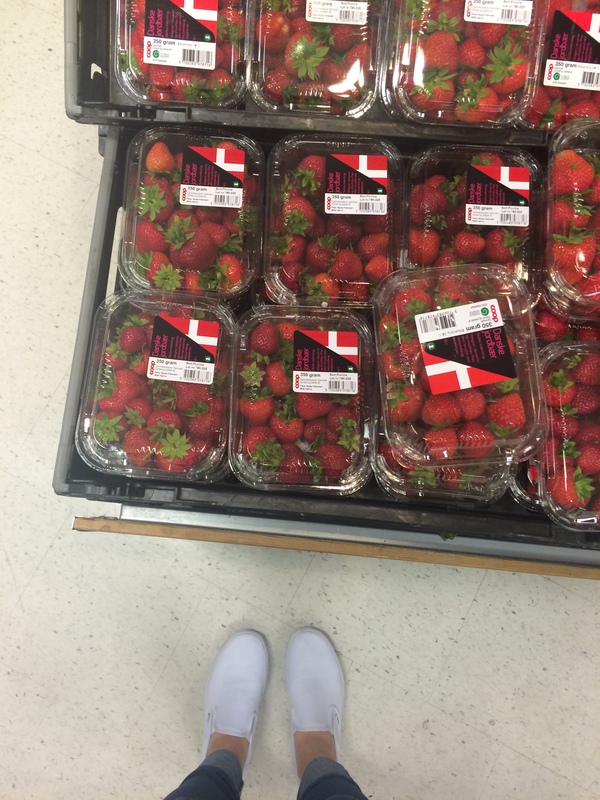 I took a picture of these strawberries in the supermarket for proof, but I’ve also seen it in shop windows and on the packaging of so much else–like cucumbers and plants! They also have real flags too. Our neighbors have a super long and skinny flag flying in their backyard– think maybe 6 inches wide by 3 feet long, like this! Danes use their own money, Kroner, instead of the Euro, that is widely used over the rest of Europe! 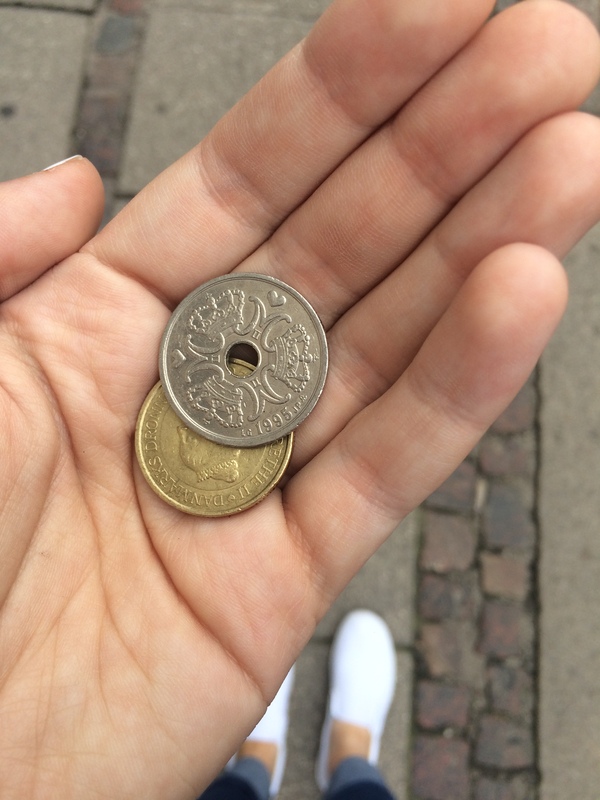 One US dollar is about equal to 6 or 7 Kroner (or DKK), so everything looks more expensive here! The comb I bought was 25 DKK, so about $3.75 in US money! I picked it up and kept wandering around the supermarket, but definitely went back to check the price of it so I could hand the cashier the right bill! Then she gave me 2 coins for change– I asked Caroline to explain how much each is worth. On Monday, we started orientation. I found Adeline at the second (!!) train station I transferred to, and then we took the metro, a different train, to get to our final destination–the Royal Academy of Music! We found Keel right outside and gosh, is it wonderful to see familiar faces when you are in a foreign country. The three of us are all living in homestays, but we are coming from different neighborhoods and have been transplanted into different types of families, so we were able to catch each other up on how each of our weekends had been. Something I have already learned about being here in a foreign country is that this experience will teach me how small I really am. Vanderbilt, the campus that seemed so large to me during move-in day freshman year, quickly became my–or our, the students’ collectively– “turf”. I didn’t realize how often I took for granted in the past two years where I lived, who I spent time with, or what places on campus we hung out or studied or anything else. I think this was compounded even more by giving tours of Vanderbilt this entire summer. By the end of it, I felt like I loved my school even more than I thought possible, but I also knew so much about Vanderbilt. The other tour guides and I were who you came to with questions. Students picked my brain about greek life and campus activities while parents picked my brain about ACT scores and financial aid. Being the one people come to for answers can feed an ego in ways I didn’t even realize possible. So why am I talking about Vanderbilt when I am over 4,000 miles (or 6,400 km, to be European!) away in Denmark? I didn’t realize how much I don’t like being the student, being the one who has to learn, until I got here. My host siblings are 6 years younger than I am, but are almost bilingual and know the area incredibly well as they have grown up here. And while I would barely ever let my parents tell me the best place to go in Wilmette for a certain item or ask how late public transportation runs, I can’t use the “I know my way around my hometown” excuse here, so I have to ask my host parents about everything. Seriously everything. I had to ask where to buy a comb. This is an entirely different place than anything I am used to–and that takes a great big heaping of humble pie in order to get myself acquainted. What’s lost is nothing to what’s found, and all the death that ever was, set next to life, would scarcely fill a cup. The hope in these words feels to me like it is bursting at the seams, waiting impatiently to seep through all our lives. Yes, I temporarily lose a lot of good things by not being at school (that I will be so excited to get back to! ): understanding “my turf,” Nashville food, having my parents come for move-in and family weekend, living with incredible girls, Chick Fil A, seeing my friends all the time, you get the picture. But what’s found? Knowing new friends, both from Vanderbilt and other schools, learning my way around Copenhagen and seeing so many other cities too, learning (!!!!! yay that is exciting), finding a church, wandering down European streets that feel like they come from a movie… Buechner was right! I love y’all so much! Thank you for reading this and for the texts and snapchats–you have to know that I do tear up talking to y’all already. I have been blessed with such a wonderful community at Vanderbilt and wow. Thank you for coming along for this ride with me! !